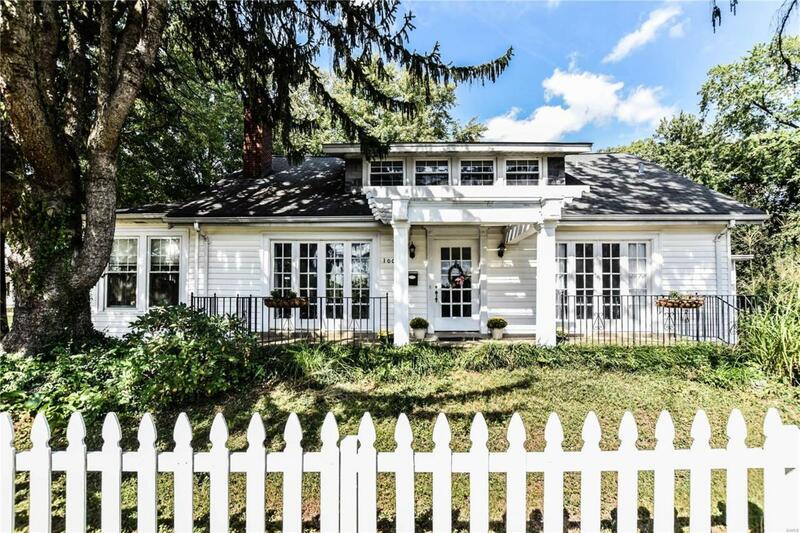 Welcome to this Charming, Historic Glendale Cottage featuring a White Picket Fenced frontyard. This 4 Bedroom cozy home is situated across the street from the Westborough Golf Course and Country Club. The gracious entry provides pergola shaded front porch. French Doors open to the front patio, perfect spot to enjoy your morning coffee or evening glass of wine. Spacious living room has gorgeous custom bow window, charming gas fireplace and is open to formal, light-filled dining room, perfect for entertaining! Match-stick original Wood floors throughout.Eat-In kitchen with newer maple cabinets, all-new stainless appliances, lots of storage. Two main floor bedrooms serviced by full bath. Upstairs you will find TWO additional bedrooms and full bathroom. Lower level ready to be finished, knotty pine paneling currently graces the walls. Basement has stairs up to the 2 car garage. Low maintenance exterior. Huge .27 AC yard shaded by mature trees and lined with fruit trees; Kirkwood schools.